Nashville, TN (March 1, 2017) – Fast-rising trio Runaway June celebrates another career landmark as its history-making debut single “Lipstick” catapults into the Top 25 at Country radio this week (source: Mediabase Country chart). 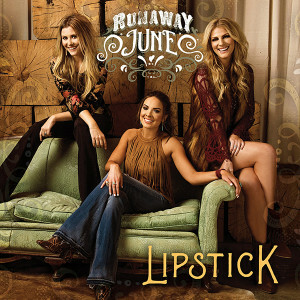 With “Lipstick,” which Rolling Stone lauds as one of the “Best Songs of 2016,” Runaway June smashes a decade-old record becoming the first all-female trio in over ten years to earn a Top 25 hit on the Mediabase Country chart. Fresh off being recognized on nearly every “One to Watch” list for 2017 including The Huffington Post’s “Top 10 Artists to Watch in 2017,” Music Choice’s “#RisingCountry Playlist Act,” Pandora’s “Country Artists to Watch in 2017,” Rolling Stone’s “10 New Country Artists You Need To Know,” and several more, the red-hot Wheelhouse Records trio has been named as a Taste of Country RISERS act today (3/1). An inaugural year-long program, RISERS highlights country music’s most promising acts poised for stardom in 2017. Throughout the campaign, Taste of Country provides exclusive interviews and performances, featured sets at major country music festivals, and spotlights on the Taste of Country Nights radio show. Read more about Runaway June’s latest prestigious accolade HERE and join the conversation using hashtag #tocRISERS. Already in 2017, the gypsy-hearted female trio has opened shows for the legendary Garth Brooks and Willie Nelson. They will continue to dazzle audiences coast to coast on a mixture of headlining and supporting dates as well as several major country music festivals this summer. For tour dates and more information on Runaway June, please visit: www.runawayjune.com.